Browse: Home / Blog / after all isn’t one mountain, one boulder, and one day at a time. after all isn’t one mountain, one boulder, and one day at a time. Sisyphus was a Titan that was cursed by the gods to roll a boulder everyday up the side of a mountain and at night it would roll back down to the bottom and for him to repeat the task again and again for all eternity. When the gods came to gloat at his predicament Sisyphus would smile in contentment because he knew what he would be doing the next day and after all isn’t one mountain, one boulder, and one day at a time. 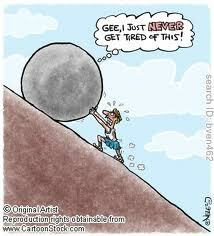 Okay, if you say, “it isn’t one mountain, one boulder or one day at a time”, what is it? Just meaningless hard work or something else? To be present to one’s self is freedom. It matters not how ones time is taken, but to be present to it is everything. Life is not easy but we have a God who, according to the bible says he will never leave or forsake us in and during our time of sorrow or need even in our triumph and joy ! For me this has helped me to stay sober and focused. I have suffered many sorrows from a early age, being born and raised steeped in abuse, addiction, and abandon. My adult life has been a large challenge to become the woman I am today! Far from perfect but I can sleep good at night knowing I’m fighting the good fight !! So yes either boulder or be it mountain just keep moving forward ONE DAY AT A TIME ! My one-day-at-a-time is about being prepared to take tomorrow as it comes and to be prepared to deal with it as it presents itself. I don’t want to know what tomorrow will bring, because that means that there will be no growth. Leave a Reply to kimberly Click here to cancel reply.